Your browser does not support inline frames or is currently configured not to display inline frames. Graphalloy High Temperature Bearings For Dampers, Ovens, Pumps, Kilns, Lehrs. GRAPHITE METALLIZING CORP - Graphaloy provides simple solutions for high temperature bearing problems. GRAPHALLOY, graphite/metal alloy, is a unique self-lubricating carbon bushing and graphite bushing material that offers superior performance in hundreds of high temperature mechanical and electrical applications. Self-lubricating performance for hi temp and high temperature bearing and bushing applications. High temperatures cause oil and grease to fail; high temperatures cause plastics to fail. The answer is often Graphalloy. GRAPHALLOY, graphite bearing and carbon bearing materials, for high temperature bearing and submerged applications, come in standard and custom designed bushings, bearings, and pillowblocks to provide lifetime cost savings and significant operating advantages over conventional bushings and bearings. Metallized graphite and metallized carbon materials for high temperature bushings and high temperature bearing applications. Typical materials and applications for which Graphaloy bearings are substituted include graphite and graphite bearings, metallizing, self lubricating bearings, high temperature bearings, metallized, carbon, graphite, self-lubricating, bearing, bushing, high temperature, carbon graphite, graphite-carbon, graphallast, graphlon, peek plastic, metcar. GRAPHALLOY®, a graphite/metal alloy, is ideally suited to applications where temperatures are too high to permit the use of oil or other lubricants. GRAPHALLOY High Temperature Bearings and Bushings will not soften at extreme temperatures or extrude under load. 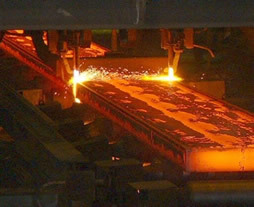 Many grades are suitable for temperatures to 750°F (400°C) in air. In addition, special grades provide service up to 1000°F (535°C) and higher in non-oxidizing atmospheres. Use GRAPHALLOY Bearings and Bushings in bakery and industrial ovens, glass plants, conveyors, dryers, kilns, kiln cars, stokers, soot blowers, oil guns, gypsum board and veneer dryers ...wherever temperatures are too high to permit the use of oil or greases. Do you have a troublesome, high temperature application? If so, tell us about it by clicking here and our sales engineers will contact you. Or, if you prefer, you may contact us directly. Here are examples of how GRAPHALLOY Bearings and Bushings have solved problems, reduced costs and downtime, and increased productivity in high temperature applications. A division of a large food manufacturer specializing in frozen pizza was experiencing difficulties with the operation of their bakery ovens. The conventional oil-lubricated bearings being used in the ovens were lasting only one week. The customer had been replacing 16 to 20 burned-out bearings every seven days for over one year. GRAPHALLOY high temperature bearings were installed. Many months later, these bearings did not show any signs of wear. GRAPHALLOY has delivered over $10,000 in savings per year for one pulp mill. The lime kiln conveyor, operating at more than 650°F (343° C) had bearing failures every few months. As a result, maintenance costs were rising and production was declining. The use of GRAPHALLOY Bearings eliminated the additional maintenance and increased productivity. 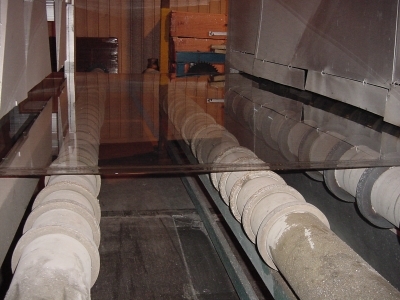 For this glass cook top manufacturer, cam followers were failing on a conveyor that traveled through an oven at more than 600°F (316°C). The high temperature grease lubricant being used was inadequate. Maintenace costs were high at $100 per hour. A mill reclaiming metals such as titanium feeds metal powders into a drum heated to 1500ºF (816°C). The drive shaft spinning the drum is supported by two GRAPHALLOY Pillow Blocks. In addition, GRAPHALLOY Bushings are in the 12 wheels that support the drum as well as the worm gear. This application demonstrates the ability of GRAPHALLOY Bushings to perform in extreme temperatures. This Midwestern steel mill was using GRAPHALLOY Bushings for the horizontal rollers in their cooling beds. The bushings were thriving under severe heat and water spray conditions. Because of the success with the horizontal rollers, the mill wanted to consider GRAPHALLOY Flange Bearings for another application: the vertical guide rollers along the sides of the cooling beds used to keep the hot steel from running off the sides. 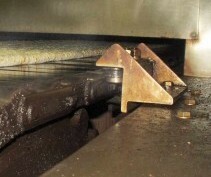 Guide rollers remain static until a piece of hot steel slams up against them, at which time they are expected to turn instantly to guide the steel back onto the cooling bed. This mill had been using conventional greased rolling element bearings in the vertical guides that were lasting only a few months. Based on the success with the vertical rollers, the mill has since retro-fitted additional lines with GRAPHALLOY. Click here for sizing information about GRAPHALLOY high temperature bearings.